Our office assists clients with Personal Injury, Social Security Disability, Family Law, Immigration Law, Criminal Law and Civil Law matters. We believe that all people, regardless of their origin, deserve the full protection of the law at all times. Our firm has represented individuals, families and businesses on a wide range of legal matters. Our staff is fluent in Amharic and Somali and can guide both English and non-English speaking clients through the often confusing and intimidating American legal system. Clients of our firm can expect honest advice, conscientious communication, and sensitivity to cultural concerns and language barriers. We are committed to offering our clients personal attention, affordability and accessibility on every case. Contact us immediately for a free legal consultation to ensure that your case is properly handled from the beginning. Our attorney’s will discuss your case with you confidentially. To learn more about our practice and our attorneys, feel free to click on the links on this webpage or contact us by telephone or email. Abdinasir is the firm’s principal attorney. He is licensed to practice law in Minnesota and the District Court of Minnesota. 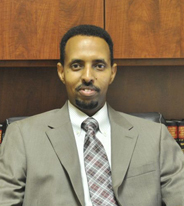 On immigration law matters, Abdinasir represents clients throughout the United States and worldwide. Abdinasir was the Chief Justice of the Supreme Court of the state of the Somali Region in Ethiopia for four years. He also previously worked with Southern Minnesota Regional Legal Services. Christopher is licensed to practice law in Minnesota and Missouri. While in law school, Christopher was a judicial extern for the Honorable Judge Edward Wilson, in Ramsey County. Christopher joined the AMA Law Group, in 2011 and practices in the areas of immigration, personal injury, contracts, no-fault arbitration, and other general civil litigation.